A Danish astronomer Tycho Brahe (1546-1601) admired Copernicus’ work especially for his mathematical solutions. He believed, however, that the elegance of the heliocentric model was too high a price for abandoning the idea of an immovable Earth. What is more, even Brahe’s most thorough observations conducted on the isle of Hven, did not prove the existence of an annual parallax of stars, which should be the result of Earth’s motion around the Sun. That is why Brahe still believed that the dogma of a fixed and immovable Earth consistent with the Bible and Aristotle’s physics was real. Brahe discovered additional support in his search for the right model of the universe in his observations of Mars, which, as we know now, were wrong - it seemed that it was sometimes closer to Earth than the Sun. It was in so far important as both in the systems of Ptolemy and of Copernicus Mars was always further from the Earth than the Sun. 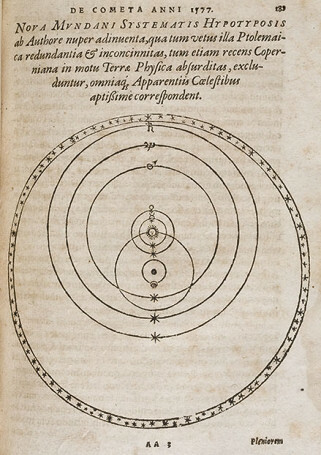 On this basis and with the conviction that planetary spheres did not exist, which resulted from the observation of a comet in 1577, Brahe suggested a model of the universe that combined the tradition of immovable Earth with Copernicus’ heliocentric geometry – geo-heliocentric system. He presented it in 1588 in a treatise on the comet from 1577 entitled De mundi aetherei recentioribus phaenomenis (On the Most Recent Phenomena of the Aetherial World), which he had carefully been preparing for several years. In Brahe’s model an immovable Earth is the centre of the universe, it is orbited around by the Moon and the Sun. The remaining five planets revolve around the Sun and only together with it do they revolve around Earth. The orbits of Mars and of the Sun intersect – it is possible, because the rigid spheres of ancient astronomy do not exist. Immovable Earth explained the absence of an annual parallax of stars, while the sphere of stars could again be located close behind the orbit of Saturn. For Copernicus proposed an empty universe: between the last planet, Saturn, and the sphere of stars, so there was a gigantic gap of at least several million earth radii. Brahe’s universe became tight again: according to the Dane the distance of the sphere of stars from the centre was only 14,000 earth radii. O. Gingerich and J. R. Voelkel, Tycho Brahe’s Copernican Campaign, “Journal for the History of Astronomy”, Vol. 29 (1998), 1–34. N. M. Swerdlow, Astronomy in the Renaissance, in Astronomy before the telescope, ed. by C. Walker (London, 1996), 187–230. V. E. Thoren, Tycho Brahe, in Planetary astronomy from the Renaissance to the rise of astrophysics. Part A: Tycho Brahe to Newton, ed. by R. Taton and C. Wilson (Cambridge, 1989), 3–21.